How are the Promotional Wristbands made? 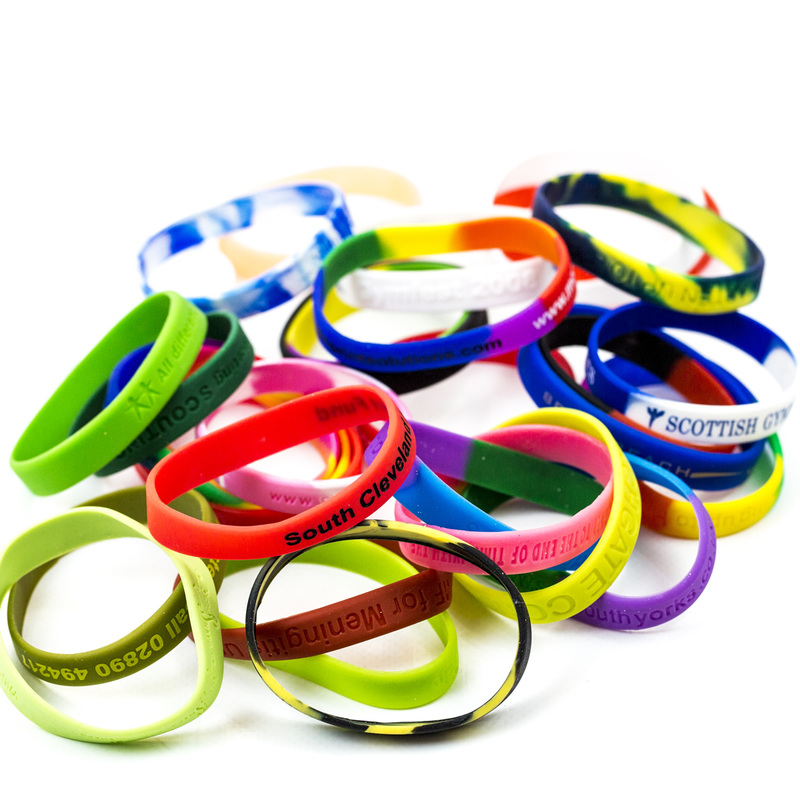 Silicone wristbands are an extremely popular promotional item and a great marketing tool for charities and fundraising. It’s mainly due to its simplicity, cost effectiveness, options to personalise and they are stylish! This blog is a curtain raiser to share the humble manufacturing story of our favourite silicone wristbands. A silicone wristband has high levels of elasticity. This aids in ‘one size fits most’ sizing. Most wristbands are manufactured with a circumference between 7 and 8.5 inches, and their width is customisable. Silicone rubber is extruded into tubes or strips of varying thickness. It is then compression moulded to set into the familiar round cross-section of a bracelet. Debossing – An imprint mould is used to recess debossed text into the silicone. This gives the silicone an engraved effect. Filling – This is the most popular options for customisation. The text is engraved and filled with a contrasting colour ink. Embossing – A great low-cost choice of customisation. The promotional content is screen printed on to the band, giving a sharp detail even for most complex logo designs. Printing – The promotional content is raised, allowing letters to be left plain or screen printed with a contrasting colour. Segmentation – These wristbands are made up of three colours, creating a segmented appearance. Bands can be customised with debossing, embossing or printing. Perfect for themes with several colours. Glowing Effect – Made up of translucent silicone, these wristbands can be customised by debossing, embossing or printing. Amazing for events organised at evenings and afterwards. Swirl Effect – These wristbands are made up of two colours that are blended together in order to create a swirl effect within the silicone. Can be customised with embossing, debossing or printing. Un-printing – These wristbands are manufactured using a blank mould, and although there is no message or logo – customising options include a range of Pantone colour choices at no extra cost! Remember to check out our Custom Silicone wristbands page for various options and pricing. We, i4c Publicity Ltd are a leading manufacturer of custom merchandise such as personalised charity wristbands, ties, tie clips, badges, keychains, medals, cufflinks, fridge magnets, trolley tokens etc. Call us now on 024 7666 7440 or email us for a no-obligation FREE quote.